Streams, lakes, and wetlands differ profoundly from one another in the conditions they provide as habitats for biological communities. Fundamental characteristics of standing water (a lentic system) or flowing water (a lotic system), the dynamics of its interaction with adjacent land and vegetation, and seasonal fluctuations in water conditions determine characteristic biological assemblages. The most apparent feature of streams is flowing water. The geomorphology and topography through which streams flow, their channel steepness, the variability in stream-bottom substrates , and the availability of woody debris are among the natural controls that influence flow patterns. The diversity in physical structure and flow among riffles, pools, and glides is reflected in equally diverse aquatic communities. A flowing-water habitat is known as a lotic ecosystem. A lentic system, such as a lake, is predominantly nonflowing. 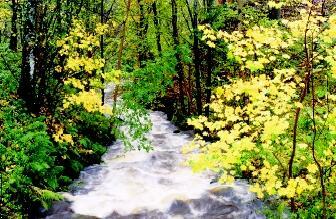 In flat valley floodplains , streams naturally meander, or flow in a winding path. * In these systems, flooding is an important natural process: nutrient-rich sediments are deposited onto the floodplain, and young fish are protected in quieter areas away from high flow. Terrestrial (land-based) invertebrates become important sources of food during these times. Under the stream and beneath floodplain soils, water flows in the subsurface in the hyporheic zone. Waters are cooled, nutrients are exchanged, and invertebrates are specially adapted to live in this subterranean habitat. A river basin consists of its entire upstream network: its watershed is the landscape, including the stream network and the land it traverses. Riparian (streamside) zones make up the transition between stream and terrestrial environment, encompassing the area where vegetation and streams interact. Riparian plants provide shade, cool the stream, retain soils, and filter nutrients. Fallen leaves decompose and provide nutrients for stream microorganisms and invertebrates. Changing habitats along the longitudinal stream gradient, from its headwaters to downstream reaches, can be thought of as a stream continuum. Energy possessed by the stream and aquatic communities tend to follow this continuum in predictable ways. Leafy inputs are most important in headwaters, whereas algae are more important as a food base in wider, more sunlit reaches. Nutrients released from streambanks and within the stream are taken up by algae in a downstream spiral of repeated uptake and release. Macroinvertebrates in the stream continuum are classified into functional feeding groups, depending on how they obtain food. In headwaters, shredding invertebrates, dependent on decomposing leaves, are common. As streams open up, scraping macroinvertebrates that scoop algae off rocks are more abundant. Collector invertebrates either gather or filter out small edible particles everywhere, but in wide, deep rivers they dominate with plankton . As adults many stream invertebrates move into the terrestrial environment. In stream food webs , primary production (the foundation of food chains) comes from riparian inputs and algae, and most invertebrates are herbivores or detritivores . Top predators are primarily fish but also include birds, amphibians, and humans. Invertebrate predators are relatively few. Fish move easily between habitats, and many feed on both stream and riparian invertebrates. A few birds spear large invertebrates that avoid fish predation. Other birds and bats capture adult aquatic insects that emerge from the stream. Lakes are characterized by basin shape, volume, and depth. Shallow edges where rooted vegetation persists are nursery grounds for fish and diverse invertebrates. * The open-water (pelagic) zone is classified into layers, depending on the degree of mixing that occurs. Water changes density with temperature, causing lakes to become layered, or stratified, into temperature zones. Consequently, significant energy is needed to mix a lake's thermal layers. Deep lakes are stratified into a warmer, upper layer that mixes readily (epilimnion); a middle layer of quickly changing temperatures (metalimnion); and a deep, cool bottom layer that mixes infrequently during the year (hypolimnion). Wind easily mixes shallow lakes, so these layers either do not persist or do not develop. Phytoplankton , predominantly algae, form the base of a lake's food chain. These primary producers fall into five major categories (see table). These major categories also are represented in streams. A community of microscopic zooplankton lives in a lake's upper layer, feeding on single-celled or small colonial algae. In clear, relatively unproductive lakes, zooplankton consume much of the algae. Very productive lakes are much less clear, with abundant algae in blooms of filamentous forms. Diatoms (Bacillariophyta) Primary pigments are chlorophyll and carotenes so they appear yellow-brown in color, have cell walls made from silica, often have early season dominance, cell walls may persist for thousands of years in sediments where they are useful for determining historic water characteristics. 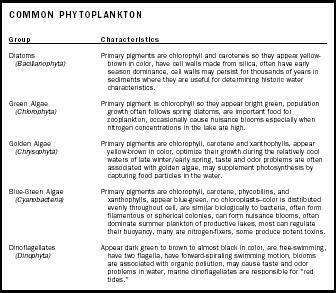 growth often follows spring diatoms, are important food for zooplankton, occasionally cause nuisance blooms especially when nitrogen concentrations in the lake are high. yellow-brown in color, optimize their growth during the relatively cool waters of late winter/early spring, taste and odor problems are often associated with golden algae, may supplement photosynthesis by capturing food particles in the water. xanthophylls, appear blue-green, no chloroplasts-color is distributed evenly throughout cell, are similar biologically to bacteria, often form filamentous or spherical colonies, can form nuisance blooms, often dominate summer plankton of productive lakes, most can regulate their buoyancy, many are nitrogen-fixers, some produce potent toxins. have two flagella, have forward-spiraling swimming motion, blooms are associated with organic pollution, may cause taste and odor problems in water, marine dinoflagellates are responsible for "red tides." Water chemistry plays an important role in lake dynamics, as nutrients influence algal productivity and higher trophic levels . In deep lakes, the bottom layer has little oxygen when it is not mixing, and few organisms survive there. Similarly, very salty lakes contain only a few highly specialized zooplankton. When fish occur in lakes, they are the dominant predators. * Fish are visual predators and select prey on the basis of size. They consume the largest zooplankton, and remaining zooplankton will be small. A trophic cascade occurs as the top predators (fish) depress the next trophic level (zooplankton), releasing high production in a third level (algae). In fishless lakes, invertebrate predators dominate, and large herbivorous zooplankton escape predation. Wetlands generally are more shallow than lakes and have standing or flowing water above, near, or below the surface. They vary in size, from puddles to thousands of hectares (a hectare is 10,000 square meters). Because water is not necessarily present year-round, characteristic waterlogged soils or plants help identify their location and extent. Wetlands often are intermediate habitats, representing a transition between aquatic and terrestrial habitats. Their transitional position makes them key exporters of organic materials and sinks for nutrients. Persistent, shallow standing water forms a permanent wetland. When soils are saturated for only part of the year, temporary or ephemeral wetlands are created. Habitat loss due to human activities has severely affected fresh-water ecosystems. Because of filling and draining activities more than half (53%) of wetlands in the continental United States were lost between 1780 and 1980. Dams, channelization , wood removal, and flow alteration have reduced stream habitat significantly. Profound changes from accidental and intentional introduction of nonnative plant and animal species have altered aquatic communities and destroyed habitats. Acid rain and other consequences of air and water pollution have severely damaged lakes, streams, and wetlands. Cumulative effects of these activities often result in declining native flora and fauna. Although scientists and decisionmakers recognize many alterations caused by humans, they have just begun to develop scientific and political understandings for fresh-water restoration. SEE ALSO Algal Blooms in Fresh Water ; Amphibian Population Declines ; Biodiversity ; Fish and Wildlife Issues ; Fisheries, Fresh-Water ; Instream Water Issues ; Lake Health, Assessing ; Lakes: Biological Processes ; Lakes: Chemical Processes ; Lakes: Physical Processes ; Microbes in Lakes and Streams ; Nutrients in Lakes and Streams ; Pollution by Invasive Species ; Pollution of Lakes and Streams ; Stream Ecology, Temperature Impacts on ; Stream Health, Assessing ; Stream Hydrology ; Stream, Hyporheic Zone of a ; Wetlands . Brooks, John Langdon, and Stanley I. Dodson. "Predation, Body Size, and Composition of Plankton." Science 150 (1965):28–35. Cole, Gerald R. Textbook of Limnology. Prospect Heights, IL: Waveland Press, 1994. Gregory, Stanley V. et al. "An Ecosystem Perspective of Riparian Zones." BioScience 41 (1991):540–551. Hauer, F. Richard, and Gary Anthony Lamberti. Methods in Stream Ecology. San Diego:Academic, 1996. Mitsch, William and James G. Gosselink. Wetlands. New York: Van Nostrand Reinhold, 1993. Vannote, Robin L. et al. "The River Continuum Concept." Canadian Journal of Fisheries and Aquatic Sciences 37 (1980):130–137. Microbial and insect community interactions in small, specialized habitats are fascinating natural microcosms. The small pools formed in pitcher plants (a carnivorous wetland plant) comprise one of many specialized aquatic habitats. The pool of water at the bottom of the pitcher plant's "pitcher" not only traps insects, but also harbors bacteria, protozoa, and aquatic intertebrates. In the southeastern United States alone, more than 17 invertebrate species are obligate associates of pitcher plants. Tight physiological ties between plants and animals often exist within these tiny habitats. For example, larval insects can enhance nutrient and carbon dioxide availability to the host plant. Other special habitats include tree holes, the leaves of bromeliads, and even the interior of abandoned automobile tires. On slightly larger scales, splash zones of streams and ephemeral vernal pools also have unique taxa that respond to very unusual conditions. Unpredictable periods of wetness and dramatic temperature changes contribute to invertebrate diversity in these small habitats. * See "Estuaries," "Everglades," and "Wetlands" for photographs of wetlands. * See "Forest Hydrology," "Stream Channel Development," and "Stream Ecology, Temperature Impacts on" for photographs of meandering streams. * See "Lakes: Biological Processes" for a diagram of a generalized food web. * See "Lakes: Biological Processes" for a diagram of lake zones and representative organisms.